An officer of the Afghan security force in Herat opened fire on troops Monday, killing a soldier who was a member of the U.S.-led military coalition, officials said. Officials did not give details of the attack, which killed two others, the Washington Post reported. Pentagon spokesman and Army Col. Rob Manning said the soldier was not American, but did not say if any U.S. troops were injured. Monday’s was the second attack involving the U.S. military in Afghanistan in the last few days. The Pentagon confirmed Sunday Army Brig. Gen. Jeffrey Smiley, who is overseeing the NATO military advisory mission in southern Afghanistan, was hurt in an attack in Kandahar province Thursday. Thursday’s incident killed Abdul Raziq, Kandahar’s controversial top police general, and intelligence officer Abdul Momin. 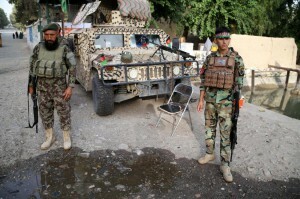 The attack also forced officials to delay parliamentary elections in Kandahar.